Rob Salthouse gives the thumbs up to the bowman during a sail change CAMPER with Emirates Team New Zealand during leg 4 of the Volvo Ocean Race 2011-12, from Sanya, China to Auckland, New Zealand. The main pack of five boats led by CAMPER continued to weave their way east in search of trade wind sailing on Friday, as lone wolf PUMA Ocean Racing pinned everything on the arrival of a northerly breeze in the coming days. 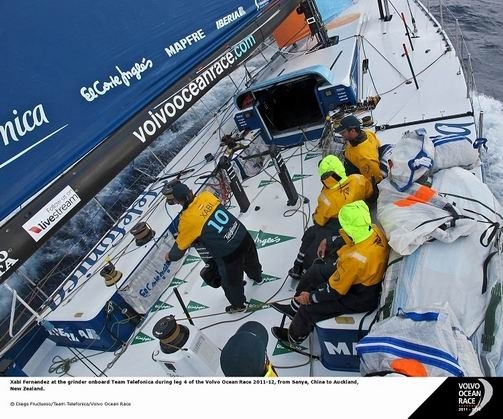 PUMA’s radical northerly route has seen them closing in on Japan rather than the Leg 4 destination of Auckland but Ken Read’s crew could be the first to benefit from the fresh breeze expected to sweep across the fleet over the weekend. Andrew Cape, navigator on Iker Martínez’s fifth placed Team Telefónica, believes PUMA are far from out of contention on this leg having made their breakaway move after being close to the Spanish overall race leaders the previous day. Xabi Fernandez at the grinder onboard Team Telefonica during leg 4 of the Volvo Ocean Race 2011-12, from Sanya, China to Auckland, New Zealand. Cape said that the fleet’s north easterly track towards the trade winds could continue for a good while yet making the current Distance To Finish rankings meaningless at the moment. “It’s all about your positioning in relation to the coming breeze,” he said. “There’s still a lot of things to be ironed out but we are just doing the best with what we’ve got. “With the low pressure situation off Japan everyone has chosen to go north away from the rhumb line to wait until the trade winds are established again which could mean we have to sail another thousand miles east. Cape acknowledged that to be racing away from the finish line must appear counterintuitive to the casual outside observer of the race. “It looks pretty stupid and is really pretty stupid but it’s the best way to get to New Zealand, unfortunately,” he said. PUMA Ocean Racing powered by BERG have been picking their way through a myriad of tiny Japanese islands and had to delay their first turn east to clear a newly formed volcanic island but are now heading east parallel with the fleet. Navigator Tom Addis prepares the runner winch before a tack, with Brad Jackson at the Helm. 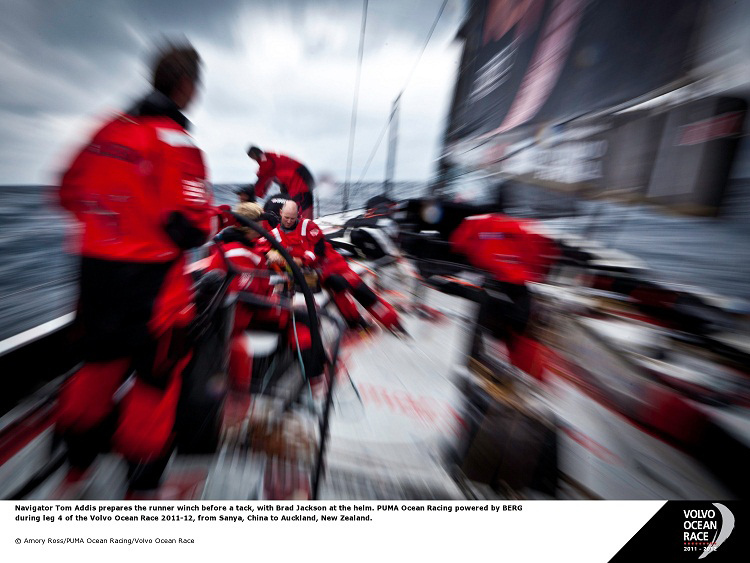 PUMA Ocean Racing powered by BERG during leg 4 of the Volvo Ocean Race 2011-12, from Sanya, China to Auckland, New Zealand. “When we finally found the penultimate shift to start our long trek east, we had to wait for five miles to avoid tacking through a microscopic volcanic summit called Taisho To — only two years old,” wrote PUMA MCM Amory Ross. “By any measure we are still doing the right thing for our particular set of circumstances,” Ross said. “Tom (Addis, navigator) and Ken (Read, skipper) have worked tirelessly to decode the forecasts. The computer models don’t tend to lie. “So we will just have to wait this one out and see what happens,” Ross concluded. Franck Cammas, skipper of second-placed Groupama sailing team said his main focus was on getting east as quickly as possible to be well positioned against the fleet when the breeze became more favourable. 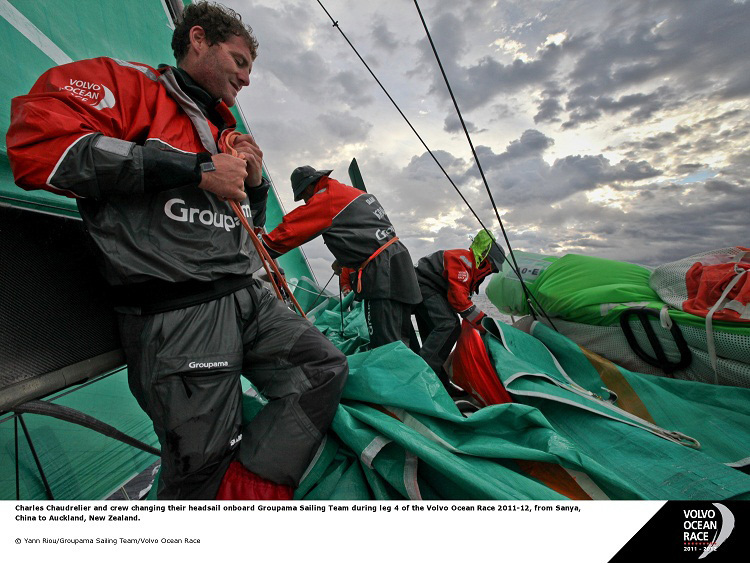 Charles Chaudrelier and crew changing their headsail onboard Groupama Sailing Team during leg 4 of the Volvo Ocean Race 2011-12, from Sanya, China to Auckland, New Zealand. “At some point the wind will come from the north,” Cammas said. “We don’t want to be too south to be amongst the first to get it. 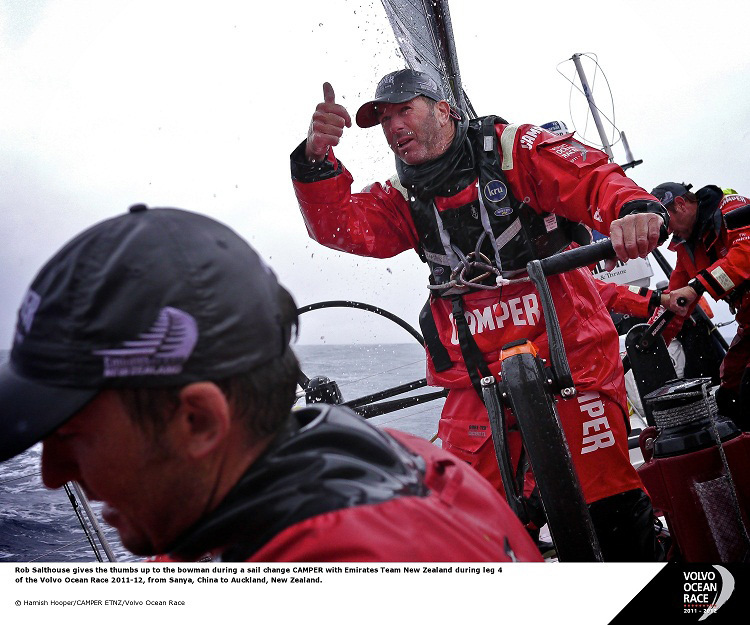 With reaching conditions still to come in the still more than 4,500 nautical miles to Auckland, which could favour the French boat and help them close down CAMPER with Emirates Team New Zealand, Cammas said he was happy with second place at this point. “We feel comfortable reaching, especially compared to CAMPER,” he said. “We are happy not to be far from them. 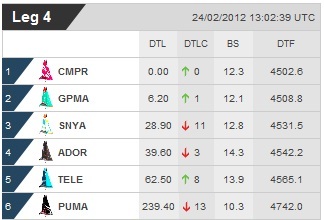 The good reaching boats for example Telefónica are still a bit behind and that’s not a bad thing either. While happy to have regained the lead on their homecoming leg, CAMPER have been unable to shake off second-placed Groupama who are in clear view on the horizon.